Arrow is a planned commuter rail line in San Bernardino County, California, United States. It is planned to run between the San Bernardino Transit Center in downtown San Bernardino and the University of Redlands in Redlands, California and will be operated by Omnitrans. Service was expected to begin in 2020, but this was pushed back to 2021 based on available funding. In planning, the system was known as Redlands Passenger Rail Project (RPRP or RPR), and underwent several design revisions before arriving at the final blend of rail technologies. Previous rail service in Redlands included the Pacific Electric "Red Car" trolley system and the Atchison, Topeka and Santa Fe Railway. 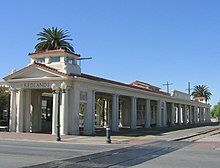 The PE's San Bernardino line served Redlands from Los Angeles by way of its Eastern District, which opened in 1905 and was abandoned in 1937. Extant infrastructure includes the PE right of way, the ATSF's Redlands depot and the Redlands Trolley Barn. Proposals for a restored passenger rail connection between San Bernardino and Redlands were made as early as the 1990s, with the service originally projected to start in 1995. This date has progressively been delayed to 2013, 2015, and 2018. By 2011, the estimated cost of construction had dropped to[clarification needed] an estimate of between $130 million and $150 million. The first contract for the project was awarded on November 2, 2011, by SANBAG to HDR, Inc. for engineering and environmental services. The contract was an amendment to an existing contract for HDR to work on a separate project in the region, the extension of the San Bernardino Line to a new terminus at the San Bernardino Transit Center. Work was initially expected to begin in late 2012 or 2013, with the estimated start of service ranging from 2015 to as late as 2018. The project encountered further delays, including the U.S. federal government's shutdown in October 2013, after which point the construction was slated to begin in fall of 2016. In February 2014, the project was delayed again, when a San Bernardino Associated Governments (SANBAG) document said that "construction is planned to begin in late 2015 with operation in 2018." In 2015, SANBAG officials said the line was expected to be complete and operating in 2020. By July 2016, construction was planned to begin in 2017 and service in 2020. In July 2016, the project received an additional $8.6 million from the U.S. Department of Transportation in the eighth round of the TIGER grant program. The service was officially dubbed Arrow in November 2016. The San Bernardino Association of Governments is expected to seek bids for mainline track rehabilitation valued at $132.3 million in January 2019. In 2011, planning for phase two of the project saw light rail vehicles or diesel multiple units replace the conventional rolling stock (then envisioned to be ex-Metrolink heavy rail equipment), the construction of five more stations, and additional passing sidings to allow 15-minute peak period headways and 30-minute off-peak headways. The estimated construction cost is between $80 million and $100 million for light rail or between $225 million and $300 million for diesel multiple units. Running costs would be between $11 million and $14 million for light rail or between $12 million and $16 million for diesel multiple units. A potential further phase would expand trackage in a loop to Highland and San Bernardino International Airport before returning to downtown San Bernardino. Services may eventually be expanded along Metrolink corridors in the future. The first phase of construction will include replacing all track on the line, rebuilding five bridges, and installing 24 grade crossings. The 9-mile (14 km) route will use the former Pacific Electric and Atchison, Topeka and Santa Fe Railway lines. While mostly a single track line, 2 miles (3.2 km) of double track will be constructed in the middle of the route to allow vehicles to pass each other. Five initial stops were proposed: three in Redlands and two in San Bernardino, with an initial projected ridership of between 1,600 and 1,800 passengers daily. With connecting service to Metrolink trains and sbX bus rapid transit in San Bernardino, the five new stations would be located at the San Bernardino Transit Center, Waterman Avenue next to the Inland Regional Center, New York Street near Esri headquarters, Downtown Redlands (adjacent to and possibly integrating the historic Redlands Santa Fe Depot), and the University of Redlands. SANBAG and the city of Loma Linda made initial plans in 2015 for a station on California Street in that city, but it was ultimately dropped from consideration. In November 2016, SANBAG officials said the Waterman Avenue station would be built at Tippecanoe Avenue instead, citing higher ridership at the proposed Tippecanoe station due to the Inland Regional Center's heightened security after the San Bernardino mass shooting, as well as zoning modifications near the Waterman stop. Low-volume freight service by BNSF will continue on a portion of the route. In September 2010, the SANBAG considered options that included Metrolink train service, other types of electrified or diesel trains, and buses. In April 2011, SANBAG announced that it had settled on conventional heavy rail equipment for the service. This would be provided by refurbished ex-Metrolink rolling stock operating on 30-minute peak period headways and hourly off-peak headways. While SANBAG preferred electrified light rail, its $268.1 million cost was over the $250 million limit for the federal Small Starts transit grants that would have been used. The estimated cost of heavy rail service was $198.6 million, which could be paid for using federal transportation grants that were based on population and sales tax revenues. In 2015, due to community opposition to Metrolink stock, SANBAG chose diesel multiple units (DMUs) to serve as the line's rolling stock. Some Metrolink trains will continue to a station near Arrow's Downtown Redlands station along the rehabilitated track. Stadler Rail FLIRT DMUs were selected for service on the line under a $31.4 million contract. An additional train with zero emission technology is expected to be delivered in 2021 and a short section of recharging overhead line may be installed. SBCTA officials say the system may use Alstom Coradia iLint rolling stock in the future. ^ a b "Redlands Passenger Rail & Future Arrow Hybrid-Rail Service". San Bernardino County Transportation Authority. Retrieved 2018-01-10. ^ a b c d e f g h MacDuff, Cassie (16 May 2011). "Imperfect Rail Solution". The Press-Enterprise. Riverside, California: Press-Enterprise Corporation. Archived from the original on 6 November 2011. Retrieved 5 November 2011. ^ a b c d "Omnitrans names Baysden director of rail". Progressive Railroading. 28 June 2017. Retrieved 10 July 2017. ^ a b c d e Emerson, Sandra (16 November 2016). "Redlands Passenger Rail Service to be Called Arrow". Redlands Daily Facts. Retrieved 19 November 2016. ^ a b c "Next Stop: Tippecanoe Avenue in San Bernardino". Redlands Passenger Rail Project Newsletter. SANBAG. 2016-12-08. Retrieved 2017-05-05. ^ Whitehead, Brian (5 December 2017). "San Bernardino leaders celebrate debut of new passenger rail from Santa Fe Depot to city transit center". San Bernardino Sun. Retrieved 7 December 2017. ^ Hernandez, Hector, Jr. (9 November 2017). "Transit Villages planned for Rail to Redlands". Highland Community News. Retrieved 12 November 2017. ^ Emerson, Sandra (6 November 2017). "Passenger rail project remains priority for Rail to Redlands Working Group". Redlands Daily Facts. Retrieved 12 November 2017. ^ a b Emerson, Sandra (2015-05-06). "Redlands City Council updated on Redlands Passenger Rail project". Redlands Daily Facts. Retrieved 2016-03-16. ^ "Eastern District: Redlands". Pacific Electric Railway Historical Society. Archived from the original on 2017-12-05. Retrieved 2017-12-05. ^ a b c d Emerson, Sandra (2017-11-01). "Take a virtual tour of Redlands rail service that will begin in 2020". Redlands Daily Facts. Retrieved 2018-01-08. ^ Muckenfuss, Mark (2015-07-25). "Last remnant of the red cars". The Press-Enterprise. Retrieved 2017-12-05. ^ a b c d Sears, Jan (8 May 2011). "TRANSPORTATION: Metrolink trains will connect Redlands, San Bernardino". The Press-Enterprise. Riverside, California: Press-Enterprise Corporation. Archived from the original on 6 November 2011. Retrieved 6 November 2011. ^ a b c d e f g h "Contract awarded for California commuter line". Trains (Registration required). Waukesha, Wisconsin: Kalmbach Publishing. 2 November 2011. Retrieved 6 November 2011. ^ a b c d "Redlands Passenger Rail Project contract awarded". Railway Gazette International. Sutton, Surrey: DVV Media UK Ltd. 2 November 2011. Archived from the original on 4 August 2017. Retrieved 12 November 2017. ^ Waldner, Erin (1 November 2013). "REDLANDS: Passenger Rail Plan Slowed by Shutdown". The Press-Enterprise. Riverside, California: Press-Enterprise Corporation. Archived from the original on 15 January 2014. Retrieved 15 January 2014. ^ "Redlands Passenger Rail Project Fact Sheet" (PDF). San Bernardino, California: San Bernardino Associated Governments. 26 February 2014. Archived from the original (PDF) on 22 April 2014. Retrieved 21 April 2014. ^ a b c d e Emerson, Sandra (September 15, 2015). "SanBAG gives updates on cost, timeline of Redlands rail project". Redlands Daily Facts. Retrieved 17 December 2015. ^ a b c "Redlands Passenger Rail Project" (PDF). SANBAG. Archived from the original (PDF) on 2015-12-22. Retrieved 2016-03-16. ^ a b Emerson, Sandra (2016-07-28). "Redlands Passenger Rail Project gets federal grant boost". Redlands Daily Facts. Retrieved 2016-10-20. ^ a b Emerson, Sandra (2015-11-07). "SanBAG begins design of Redlands Passenger Rail Project". Redlands Daily Facts. Retrieved 2016-03-16. ^ "California Pulse: Construction Project News for December 2018". ENR California. 3 December 2018. Retrieved 7 December 2018. ^ Emerson, Sandra (7 December 2017). "City now has a name for the planned rail station in downtown Redlands". Redlands Daily Facts. Retrieved 7 January 2018. ^ a b Emerson, Sandra (2017-11-15). "What new ownership at Redlands Santa Fe Depot could mean to future rail service". Redlands Daily Facts. Retrieved 2018-01-08. ^ Sears, Jan (9 September 2010). "Passenger rail connection to Redlands still years away". The Press-Enterprise. Riverside, California: Press-Enterprise Corporation. Archived from the original on 6 November 2011. Retrieved 6 November 2011. ^ Emerson, Sandra (19 August 2016). "Where Redlands rail project is heading". The Press-Enterprise. Retrieved 6 November 2016. ^ "Technical Proposal" (PDF). San Bernardino County Transportation Authority. Stadler. Retrieved 13 November 2017. ^ Emerson, Sandra (28 July 2017). "Redlands takes next step in bringing passenger rail service to city". Redlands Daily Facts. Retrieved 31 July 2017. ^ Scauzillo, Steve (26 June 2018). "Zero-emission train from San Bernardino to Redlands would be first in North America". Whittier Daily News. Retrieved 26 June 2018. ^ Emerson, Sandra (14 September 2018). "New rail tech is reviving an old idea: extending light rail to Ontario Airport". San Bernardino Sun. Retrieved 11 March 2019.